Good questions are worth their weight in gold. Questions are most useful when they probe the edges of our knowledge base or comfort zone. Here are some questions to get you thinking beyond the box as you prepare to teach this Sabbath’s lesson to your class. This is not meant to be a discussion guide but a thought prompter for you, the teacher, so your lesson time will be creative and thought provoking. 1. The “prove-it” hijacker: One of your Sabbath School regulars comes prepared with every bit of paper and websites they could dredge up to prove that the SS topic is wrong. (This week, their argument would be that the Trinity is not Biblical.) What will you do with their demands for proof that threaten to derail your Sabbath School lesson? Suggestion: As a proactive Sabbath School Superintendent, in the prelims (or as a class leader, at the start of the discussion) explain the lesson has been prepared to explore the current Seventh-day Adventist understanding of scripture on the topic of the day. Establish that other people believe differently and are free to do so. Ask that respect be given to the teacher and the prepared topic. a. What is your favourite way to explain this conundrum? c. A science experiment? (The triple point cell where ice, water, vapour all exist in one container). d. Do you have another way of explaining it? 1. In Exodus 3:13-15 why doesn’t God just answer with a name? (Yahweh, Elshadai, etc) – Why the history lesson? God ties His name to a story. Why is it important to have a story attached to God’s Name? How do we attach stories to our name and the names of those around us? Why is this important? 2. After the Shema in Deuteronomy 6:4, why did God tell His people to tell their children about God and His presence in everyday life? What do families have to do with the Shema? 3. In Monday’s lesson a list of verses is given showing moments when Jesus was worshiped. a. Compare and contrast the stories of worship in these verses with your experiences of worship. How does this challenge you? b. When have you had a Glimpse of God and been compelled to worship in the way these people were? 1. How can we give the world around us glimpses of God by putting the Triune nature of God into action? a. How will I be the hands of the Father, Life-Giver and Merciful Sustainer, to the world around me? b. How will I be the hands of Jesus, Creator and reCreator, to the world around me? c. How will I be the hands of the Holy Spirit, Comforter and Guide, to the world around me? 2. The lesson dedicates an entire day (Thursday) to the prayer of Jesus for his followers (John 17!). Jesus’ main desire is for His people to be One as He is One with the Father. How are we doing at being one? Are we “as tight as the trinity” or do we have a way to go? a. How healthy are our relationships with others in our local church? b. What personal character development is needed? c. What community commitment is needed? d. What must be put aside? e. Why is the oneness of the Trinity so important? f. Why is the oneness of believers so important to Jesus? a. There are numerous anti-Trinitarians in Australian Adventist churches. How can we minister to these people without excluding them or encouraging their views? 2. It is part of the human condition to want to understand and explain the nature of the Divine. In the Bible, God is explained with metaphors, concepts and names. Why is this desire to understand God so prevalent? a. Muslims are vehement monotheist. Yet they have the 99 names for God to help them explain God’s unfathomable nature. b. Hindu’s have one God and a Trinity (Brahma, Vishnu and Shiva), which each represent aspects of their singular Supreme God. All of the many other Hindu gods are similarly representative of aspects of the Supreme God. Hinduism is monotheistic polytheism! 3. What other terms, stories and characters in the Bible reveal the nature of God to you? The 4H approach to Bible study was developed while preparing the 28 Stories small group guide/journal. Here is an excerpt from the introduction. Far to frequently, faith is reduced to “I believe” and belief is reduced an intellectual nod of the head. Faith is so much more. True faith is beyond belief! Beyond the head faith, which we Adventist are good at, there is so much more. These studies will take you on a faith journey in which you will explore the head, heart, hands and horizons of your faith story. Bible Story – Rewritten to connect you to the Biblical character and to direct your thoughts toward a particular aspect of the doctrine in consideration. My Reflection – Finding yourself in the Biblical narrative. My Story – Finding the principles of the Biblical narrative in your experience. My Assurance – Strengthening your faith by encouraging your heart. My Commitment – Challenging your faith by considering what you can become. My Outlook – Expanding your horizon of your God, your world or yourself. My Response – Acknowledging the doctrine and considering it’s importance. 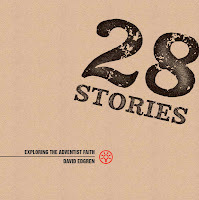 The 28 Stories Study Guide is available from the Adventist Book Centre.